In the early years of the 19th century, there was much political and social discontent. Both in Upper and Lower Canada the Legislative Assembly, elected by the people, was dissatisfied with its lack of power, and complained that the country was ruled by the Upper House or Legislative Council, by the Executive, by the Governor, by paid officials, and by the Colonial Office in Great Britain. None of these were elected by the people of Canada, nor responsible to them. In Upper Canada it was claimed that affairs were controlled by the Family Compact, a small group of men, not very correctly so called since few of them were related. 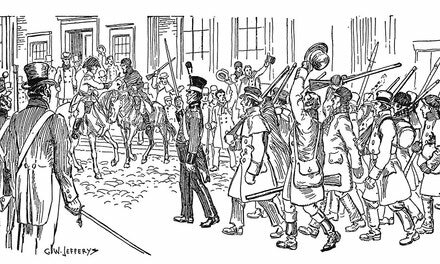 In Lower Canada, in addition to similar grievances, the French felt that they had not sufficient voice in the government. Many details of the administration of affairs were unsatisfactory, and in all the Provinces there was a growing desire for more self-government. Delegations and petitions were sent to Great Britain, to the government and the Secretary of the Colonies, complaining of these grievances, Some changes were made, but they were not sufficient to remedy the conditions under which the country suffered. By 1837, discontent had reached a dangerous stage. Many of those who desired reform began to feel that their only hope lay in rebellion, or at least in a show of armed force that would compel the governing powers to grant their demands. 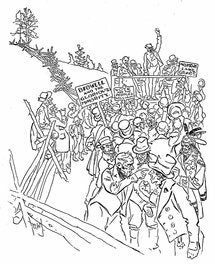 In Upper Canada, under the leadership of William Lyon Mackenzie, societies of reformers were organized in many districts, meetings were held, and delegates elected to a convention or congress which it was proposed to assemble in Toronto. Sometimes these meetings were broken up by those who were opposed to these ideas of the reformers, and so those who gathered together often came armed for self-defence. 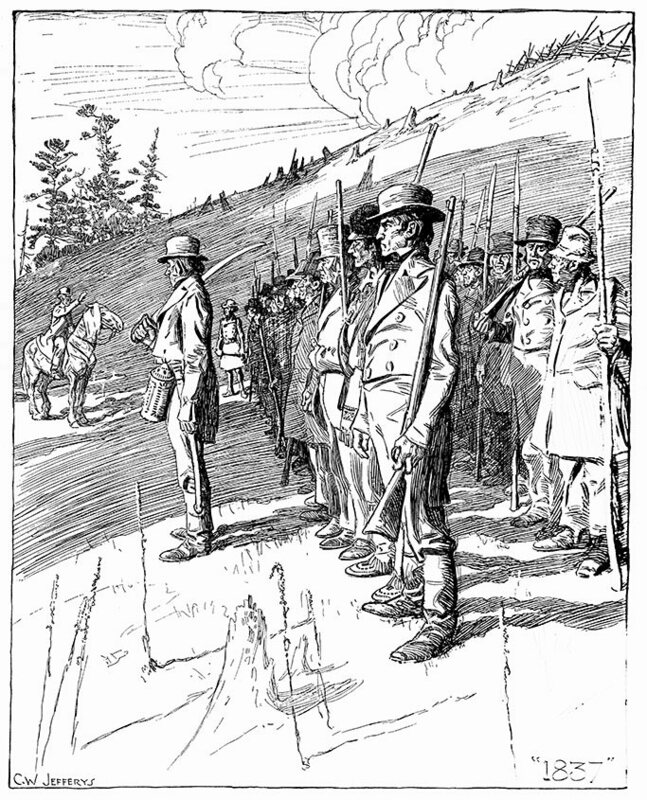 Early in the fall of 1837, military training began. Men met at sundown or at night in out-of-the-way fields and clearings in the backwoods, and were drilled and given instruction in the use of arms. Matches were arranged at which the men shot at turkeys for prizes, so that they might get practice with the rifle. Bullets were moulded in many a farmhouse and poles of ash and hickory were cut in the bush lots to be fitted with pike heads, hammered out in Samuel Lount's blacksmith shop at Holland Landing, and other forges in rebel neighbourhoods. The picture shows a party of rebels drawn up for Hrill in a rough pasture among the low, rolling hills of North York, where many such gatherings were held. Stumps and dried mullein stalks dot the autumn fields. Long shadows fall across the ground as the sun sets. A man on a heavy farm horse is giving instruction to the company. They are armed with all sorts of weapons; muskets, rifles, pikes, bludgeons, old swords from the time of the War of 1812. One of the men is dressed in buckskin shirt, leggings and moccasins, and wears a coonskin cap; he is a trapper and backwoods hunter, for there was much game in the woods then, and though he may not know much about drill, no doubt he is a good shot. A captain has a tin lantern strapped to his belt, to light him on his way when drill is over, for the men have gathered from a circle of many miles, and some of them will have far to travel in the darkness to their homes. Toronto Art League. Ninety-eight: A Calendar for the Year 1898 With Some Drawings Suggestive of Every-day Life of the Past in Canada. Toronto, Toronto Art League, 1898. n.p. Illus. October - "People met at nightfall in the corners of quiet fields --- and there, received such instruction in military drill and movements as was possible" -- Dents 'Upper Canadian Rebellion"
Graham, M. Audrey. 150 years at St. John’s York Mills. Toronto, General Pub.,1966. 275 p. Illus. Bergeron, Leandre. The History of Quebec: A Patriot’s handbook Toronto, NC Press, 1971. 243 p. Illus. The Canadian Liberation Movement. This is what Imperial Oil doesn’t want you to see.” Toronto, 1971. 1 p. Illus. Chambers, D.D.C. “Van Egmond: studies for a lost portrait.” In Northward Journal, #54, p. 7-25. Illus. Bradburn, Jamie. “Meet a Toronto Mayor: John Powell.” In Torontoist, January 7, 2014. 5 p Illus. http://torontoist.com/2014/01/meet-a-mayor-john-powell// Accessed December 27, 2016. Begbie Contest Society. “Canadian primary sources in the classroom: Rebellions of 1837.” July 2017. 46 p. Illus. http://www.begbiecontestsociety.org/Rebellions1837.htm Accessed July 29, 2017.